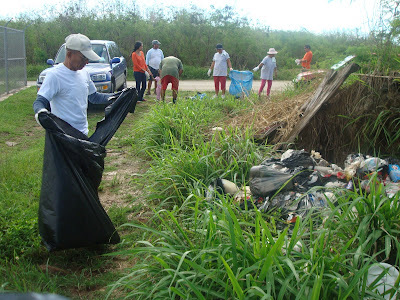 Friends of the Mariana Islands, lead by thier President Marites Castillo, assisted the Division of Environmental Quality with a cleanup on Sunday in DanDan along the Saipan International Airport fence. 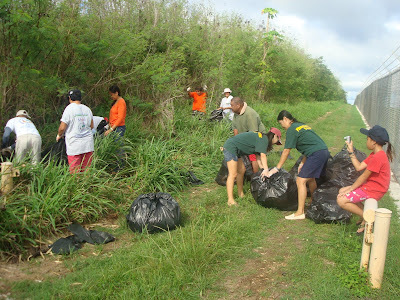 In just three hours the volunteers collected an entire trailer full of trash. Some people on Saipan are illegally using the Airport as an area to dispose of their household trash. FMI and DEQ turned this illegal dump site back into an area that the DanDan villagers and Commonwealth Ports Authority can be proud to call their own (and that CPA and MVA don't have to be concerned that our arriving tourist might see).